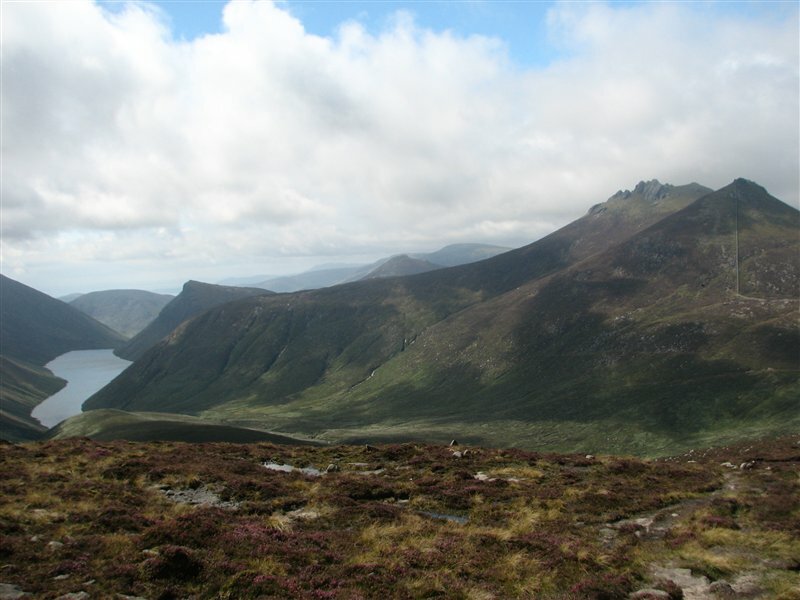 I have seen it said that if the Mourne Mountains were located across the Irish sea in Britain they could well surpass the popularity of the Lake District fells. From my recent walk along a section of the Mourne Wall I can’t argue with that sentiment. I can only be thankful that the Mournes are just a short drive up the M1 from Dublin, and that for the moment we have them all to ourselves. Our walk of approximately 15 kilometers took in the Trassey Track leading to the Hare’s Gap. From here we turned left to follow the Mourne Wall over Slievenaglogh, Commedagh and Donard. We marched up and down steep slopes taking in ever-changing views for 5 and a half hours and were left with a lasting impression on our memories…and the muscles in our legs. Note: For a driving route, click ‘P’ on the map and select Directions. As we were based in Newcastle for the weekend, my walking buddy Enda and I took a lift to the Trassey Track carpark before setting off up the track which begins just past the parking area. This starting point is only a ten minute drive from Newcastle, yet it allowed us to make our way to Slieve Donard before dropping back into town with minimal backtracking. The Trassey Track offers a gentle warm-up as it makes its way into the mountains, offering glimpses of the route ahead as the valley grew around us and large crags hung above. As the ground steeped before the climb up to the gap we began to encounter groups of people making their way up the same route. 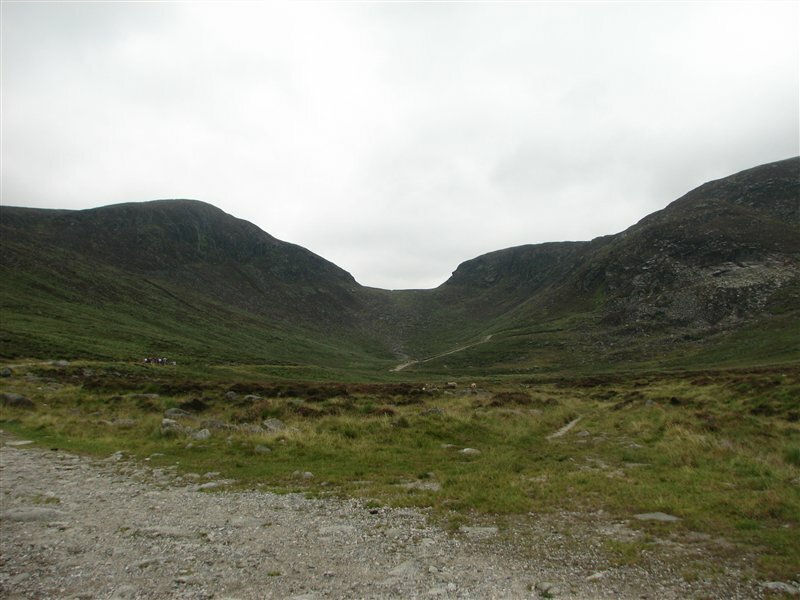 In fact, the hills were very busy, with the Mourne Seven Seven’s walk under way and huge crowds in Newcastle for a festival featuring a display from the Red Arrows. In short, I saw more people on the hills that day then I had on all my other walks combined. I suspect these mountains are always relatively busy given their proximity to Belfast, the wealth of trails to be found and the ease of navigation afforded by the Mourne Wall. The climb up to the Hare’s Gap certainly got our pulses going as we followed the rough steps up to our first sighting of the wall which crosses the gap. From here we could see into the heart of the mountains with Slievelamagan and the jagged top of Binnian in the distance. 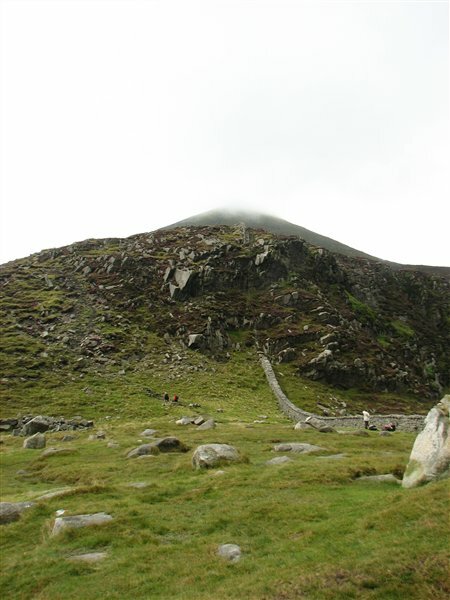 Most impressive was the steep climb of the wall ascending Slieve Bernagh, with walkers spread like ants along the route. From the Hare’s Gap we had a choice between staying low and taking the Brandy Pad as far as the col between Commedagh and Donard, or going high and tracking the Wall around to the same point. We chose the latter and pushed on up a set of steps hacked into the hillside which quickly climb above the gap towards Slievenaglogh. Passing several groups who were enjoying their lunch by the wall while sheltering from the now stiff breeze, we swung to the east towards Slieve Corragh where the views down to Ben Crom Reservoir and the surrounding peaks got better and better. At this point we were faced with a third steep climb of the day, up to Slieve Commedagh. With busy hearts and tiring legs we were surprised to see tents huddled against the wall as we neared the summit. It appears that plenty of people go wild camping in the Mournes. I’d love to do it sometime, and imagine that waking to the sunrise on a Summer morning must be an amazing experience. 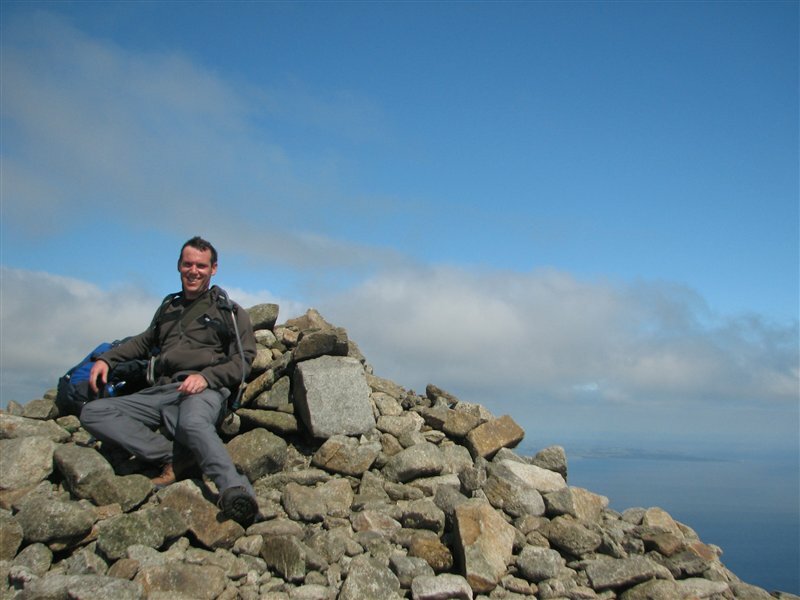 If you’d like inspiration check out this great blog post about camping along the Mourne Wall. 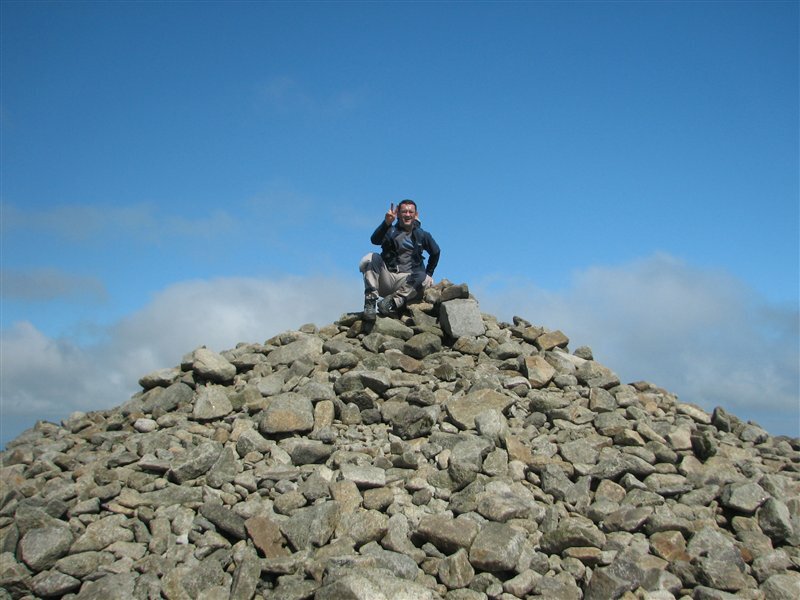 We hopped the stile and walked out to the summit of Commedagh to take a well-earned cup of coffee and some sandwiches on board before the final push to Donard which we could now see across and above us. 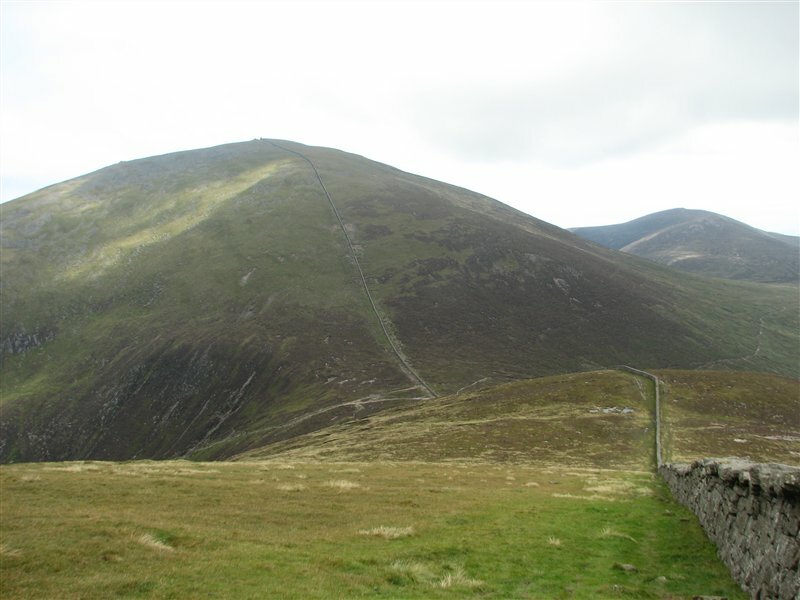 As we began descending towards the col we could see steams of people heading up along the wall towards Donard, which made us glad to have taken the higher route earlier on as we saw relatively few people during that section of the walk. At the bottom of the col the first runners of the Seven Sevens challenge we passing by on their way towards Newcastle, but we still had to tackle the climb which is fairly relentless. Gusts of wind were whistling through the wall which provided great shelter as we laboured our way up the hillside, eventually reaching the summit where the wind really was howling. From here we could see back into the mountains and down into Newcastle and on to Dundrum bay and Strangford Lough. To the south we could just pick out the Cooley Mountains. After finishing our lunch in the sun against the wall we walked down to the minor Cairn to the north of the summit and considered a free-style walk down to Newcastle before deciding to retrace our steps and follow the path down the Glen River Valley. This was a tough enough walk going down so I was very happy that we hadn’t chosen to come up this way. Having said that the walk has plenty of variety featuring steps towards the top, a walk down the valley along the river and then a pleasant stroll through the woods as the town draws near. 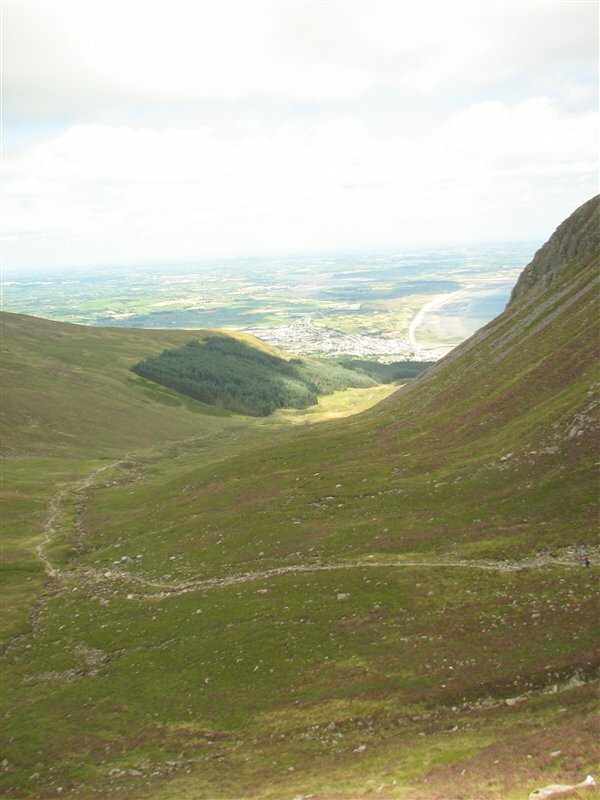 The Glen River Path as it approaches Slieve Donard, with Newcastle in the distance. Upon reaching town we walked up the main street and stepped out of the Percy French bar with an ice-cold beer apiece just moments before the Red Arrows began their display. A perfect end to a great day in the hills. Want to do this linear walk but don’t have two cars? There are lots of taxi companies in Newcastle who could take you up to the Trassey Track Car park for a modest fee. Maps. We used the Mournes Activity Map on a 1:25,000 scale. The details on this are far superiour to the 1:50,000 scaled map sheet 29. 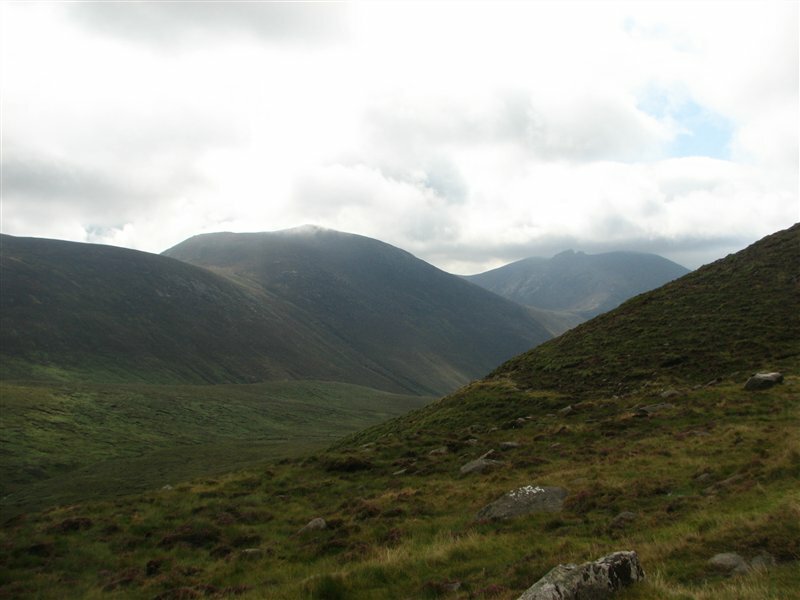 Mountainviews.ie has copious commentary on all of the peaks in the Mournes, with plenty of route suggestions. Here’s an interesting article on the Mournes that appeared in the Telegraph a couple of years ago. The Red Arrows do not generally help you celebrate the end of a hike, but you can always request a fly past. Congrats on climbing Donard. Was up there myself on the same day doing the 7 7’s! By the sounds of it, you arrived there later in the day so got the views – we were up there in a thick mist. Lovely mountain in a superb area and you chose a great route! Thanks Paul, the Seven Seven’s sounds like a great day out. I’ll have to return to the Mournes now to walk a couple of the other mountains. Binnian and Bernagh looked very appealing. Fantastic blog report – and love the pictures! Only yesterday I happened to be checking out your review of lunch in the Slieve Donard Hotel. in Ireland. Thanks for a magic day.